How Available is Your Security? All too often a massive amount of effort is put into specifying, negotiating, and installing a physical security system, yet after it is installed few people can answer the question “how’s it working?”. 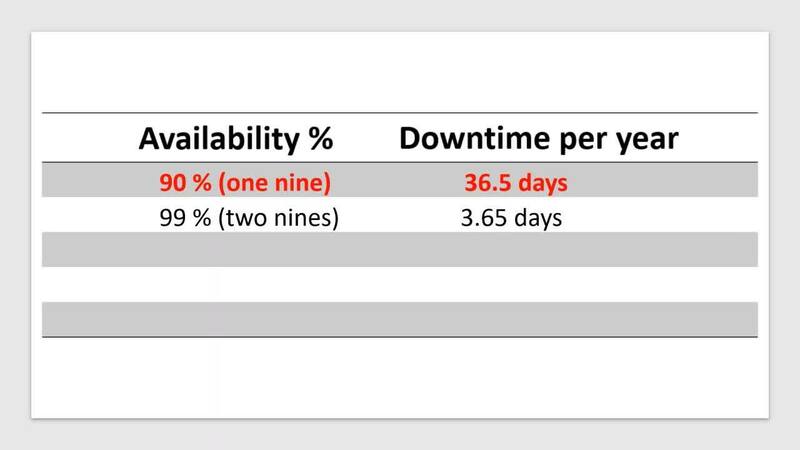 In the IT world it is very common for uptime to be a key metric for system availability, and in some cases for the system to be specially configured to be high availability. At Viakoo we believe the same should be true for physical security systems – uptime is one of the key metrics, and it should be used to guide the system towards achieving high reliability and availability. The last thing anyone wants from a security system is low availability, right? With an increased demand for reliable and performant infrastructures around physical security systems, reliability must be managed. While handling increased system load is a common concern, decreasing downtime and eliminating single points of failure are just as important – specifically as it relates to video systems. The concept of “how many nine’s” comes from IT and system design. High Availability (HA) is a system-level characteristic, which aims to ensure a high level of operational performance and functions as a failure response mechanism for infrastructure - usually expressed as a percentage of uptime - e.g. “Nines”. Instances of downtime events include power outages, failed CPU, RAM or other failed hardware components - temperature related shutdown, logically or physically severed network connections, or various application, middleware, and operating system failures. This is why for a system to be HA it typically has specific hardware functions to make that happen, such as automatically transitioning from a failing system to a still active one. Achieving High Availability is not only dependent on the hardware used; very often specialized software is needed as well. Viakoo Service Assurance is such a solution, where we automatically detects IP physical security system failures, diagnose them and provides fix-it plans to you and enables your team to achieve high reliability from IP/physical security networks. Viakoo augments the hardware-based HA capabilities to help your overall system achieve the 5 nines that everyone wants.